We got to witness the unique ” Redneck Hat Trick” on Sunday by our good friend, Daniel Pope, who came to the river with Bo’s son Trent. On a beautiful, clear but cold day, the boys started chunking streamers and it quickly got interesting. 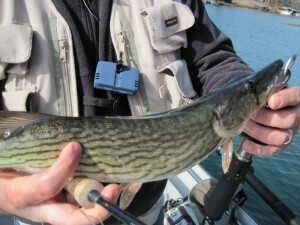 Using an olive and yellow Chuck’s Chunk, Daniel first hooked up to a good sized Chained Pickerel. 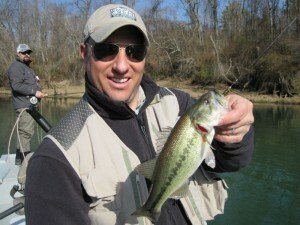 Just a few casts later Daniel was tight into a nice little Black Bass. (Yes we were fishing on the Little Red River.) 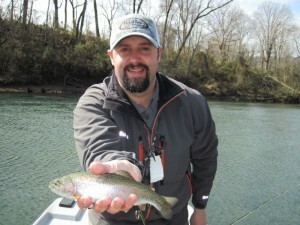 That was of course quickly followed with a fat Rainbow Trout thus completing a “Redneck Hat Trick” early in the day. Obviously we spent the rest of the day trying to connect with a Brown Trout for the “Grand Slam but it was not to be on this trip. As the sun got on the river the guys switched from streamers to nymph fishing and it was simply non stop action. Bo started complaining that he was getting tired from releasing so many Rainbows. He got no sympathy!! The same flys that have been hot for the last week continued to produce. Born’s Hairy Legged Sowbug and a gray flash back Sowbug both in size #16 were again the tickets. By about 2:00PM the boys were wearing down and the water was rising and the temperature was falling so we cranked the jet and headed for the ramp. What a cool day! 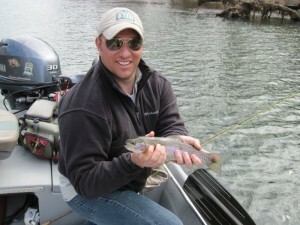 You just never know what the river will yield and that is one reason fly fishing is so great. By the way, if you ever get a chance to take a casting lesson from April Vokey don’t worry about how much it costs, just take advantage of the opportunity to work with her. Not long ago Trent got that opportunity and is it ever paying dividends. His double haul is really getting smooth and he is laying out some fly line!